Finally!! Repair, Maintenance and Operational Training Videos ONLINE and ready for viewing for ANY Commercial Embroidery Machine on the Market! If you have a Tajima, Toyota, Barudan, SWF, Happy, Melco or any other brand Commercial Embroidery machine.........THIS MEMBERSHIP IS FOR YOU!!! Over 60 hours of Detailed Instruction! We all know that Machine Repairs are inevitable and very costly. Waiting or paying for a technician is sometimes "Not an Option" and looking through a manual could take hours of your time, not to mention the frustration of trying to figure it out by yourself. Think of the last time something weird happened with your machine. You call up tech support and they tell you what the problem might be. They might even tell you how to fix it, but it still takes 4 hours of your valuable time or worse.. you spend 4 hours trying to fix it and STILL your machines are not running right. Don't wait until your machine goes down and you have 50 shirts due the next day. Take advantage of the training on within this site...so you're prepared and comfortable working on any problem your machine might have. Even if you have a NEW machine and have a problem with it, you still have to pay at least a travel charge for a service technician to come to you, which is usually around $300. If the repair was a maintenance or non-warranted problem, you can end up paying even MORE for that tech visit, not to mention the down time while waiting for a tech to be available. Maybe you know this.....Maybe you don't. Why is it that every time we have a decent size order or time sensitive order to do, our machine acts up? That's Murphy's Law in action! That's when you really need a SITE like this to give you a head start while either waiting for tech support to call you back or attempting to fix the problem on your own. Maybe tech support tells you what you need to do, but most manuals are less than understandable and the frustration makes you want to toss your machine out the window. will help you get your machine up and running faster and with less trial and error so you can get back to Making Money instead of trouble shooting machine problems. How come the manufacturers don't make more Training Videos? I don't know, but something like this has been long over due. I can only imagine that the down time, loss of business and repair costs total in the millions of dollars industry wide. Most of these businesses are home based businesses that can't afford to lose time or money! 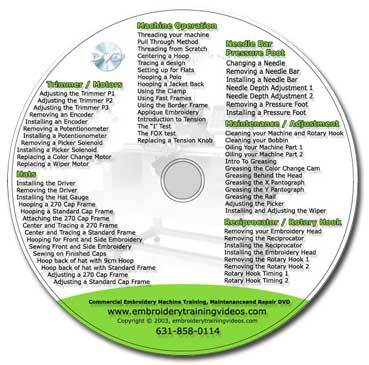 There has never been an Embroidery Training Video Membership Site as comprehensive as this, that teaches you how to properly maintain, repair and operate your commercial embroidery machine. This small investment can TRULY save or make you hundreds to thousands of dollars!! Use this DVD as a reference - use it to train new employees - use it to refresh your knowledge....whatever reason, I guarantee your investment will be well worth it! What are you going to show me that I don't already know? I remember when I first got my machine and went to training. I walked out not knowing much more than I had learned in the two weeks before, just tinkering with it. I learned everything on my own and I wore that knowledge like a badge of honor. So if you're asking that question...."What are you going to show me that I don't already know", I understand where you're coming from. However, looking back at how much time it took me to figure things out, I wish I had something available like this Membership Site. Something that could give me a jump start or point me in the right direction. All I wanted to do was make money with my machine, not be a mechanic! Now that I have a few other businesses, I seek out anything that can sharpen the learning curve, get me past the mechanics and on to making money!! This content took years to put together and I know it's worth much more, but I would rather every embroiderer have the opportunity to get this knowledge than just a few. Prepare to understand how your machine works. I've been through three of the major machine manufactures training programs and am confident that you will have a better understanding of how your machine works after exploring this Membership Site. The two to three days of training offered by the manufactures are so packed with information about your machine and software, they just don't have time to "Pull back the Curtain" and really show you the mechanics of your machine. Unfortunately, when you get back home and get around to your first order, you may find that a simple adjustment is stopping you from completing your job. You know this rings true....becuase it's the truth! or big contract embroiderer...this SITE is for you!! For the Home Embroiderer, time is everything! You cant afford to wait for a technician while your orders pile up and trying to figure out how to repair or trouble shoot your machine is frustrating, to say the least. This SITE will give you more than an idea on how to fix your machine.....watching it done, step by step, will give you the confidence and technique to get the job done right. For Retail Shops, time is of the essence. You have to know your machine inside and out in order to get jobs out the door. The more you know about your machine, the better you can troubleshoot problems and get your machine to finish any job. Using this SITE to train employees is cost-effective and greatly reduces the time you have to spend walking someone through basic machine operation. For Contract Embroiderers, this is a huge money saving tool on getting everyone up to speed on machine operation, maintenance and repair. This should be the first thing a new employee watches before touching a machine. This will save you time in training, money in repairs and help keep your machines well maintained. For $49, how could you lose? Video on creating a niche embroidery online store in minutes ! Ok, You agree this Embroidery Training Membership Site could help, but for whatever reason, you're STILL sitting on the fence. You watched some sample videos, read the information, maybe even searched and found this website while looking for training options. If you are not 100% satisfied with this Embroidery Training Video Site.....Let us know and we will refund the full amount!!! I'm not messing around here! I am so certain that this is the best $49 investment an embroiderer can make.........I don't want your money if you feel otherwise!! "Think of all the designs you have purchased....the patterns....gizmos and tons of other stuff to feed this embroidery addiction (and we all know it's an addiction). The amount you have invested in this machine (or machines) means failure is not an option.....and knowledge and training is absolutely essential to your success as an embroiderer." Buy Now! For $49 you get over 60 hours of professionally filmed, step by step training on repairing, maintaining and operating your commercial embroidery machine. I've made Training Video Subscriptions affordable for a reason....so please don't take this low price for low quality, or lacking in content. Like I said before........I want EVERYONE to be able to benefit from this knowledge. as an added bonus, watch my free Video on creating a niche embroidery online store in minutes !